Alexandria, with its geographical location in the center of Louisiana, is the hub for major state and national highways. 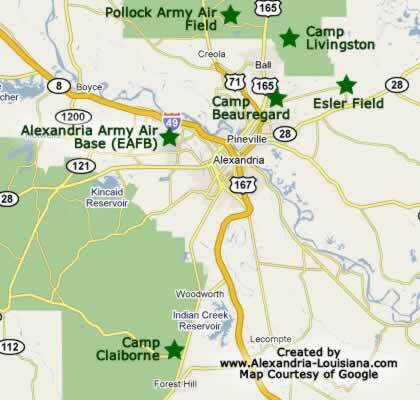 The Red River, running between Alexandria and Pineville, is crossed in three areas. Interstate Highway I-49 runs in a southeast to northwest orientation through the city. Lafayette lies to the south, Natchitoches and Shreveport to the north. MacArthur Drive is an 8-mile long multilane bypass around the western side of Alexandria, built during World War II. Throughout its length it bears the designation of US Highway 71, and in places the additional road numbers for US 165, US 167, and LA 28. In Alexandria, the main part of MacArthur drive (U.S. 71) south of the traffic circle at the intersection of Business 165, 165, and 71 is also called Jefferson Highway. Both the north and south ends of MacArthur Drive intersect with Interstate Highway I-49. US 165 has a southwest to northeast alignment; it is locally known as the "Lake Charles Highway" and the "Monroe Highway". State Highway 28 runs east-west; locals refer to it as the "Leesville Highway". The Alexandria-Pineville Expressway (aka as the Cottingham Expressway) or US 167 is a limited access road accessed via an exit from I-49. The expressway crosses the Red River just south of downtown Alexandria, passes through Pineville, and ends near the Dresser plant. State Highway 1 runs on a north-south line to the west of the Red River; to the south it is known as the "Marksville Highway". US 71 to the north lies on the east side of the Red River, and leads to Coushatta and Bossier City. US 167 runs to the north to Winnfield and Ruston. Several bridges have been built over the decades across the Red River to connect Alexandria and Pineville. Construction of the two-lane K-truss type O. K. Allen Bridge between Alexandria and Pineville was completed in 1936, and named after Governor Oscar Kelley Allen, the 42nd Governor of Louisiana. It has now been demolished. Work on the new 4-lane Curtis-Coleman Memorial Bridge to replace the old O.K. Allen Bridge began in early 2011, and was opened in 2016. The Gillis Long Bridge (or the Jackston Street Bridge) is a two-lane vertical-lift bridge with a sidewalk/bikepath on either side. This bridge connects Main Street in downtown Pineville with the business district in Alexandria at Jackson Street near the convention center and Hotel Bentley. The Purple Heart Bridge is part of the Alexandria-Pineville Expressway, and connects Interstate Highway I-49 to Highway 167 by crossing the Red River from downtown Alexandria to Pineville.